Atal Bihari Vajpayee: Surprisingly A Moderate? Despite being a long-serving member of Rashtriya Swayamsevak Sangh (RSS), Atal Bihari Vajpayee shows us how a BJP politician can faithfully serve his country without being a hard-liner. 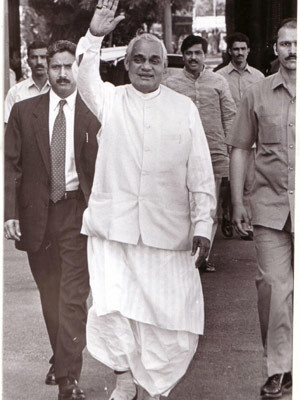 Atal Bihari Vajpayee. 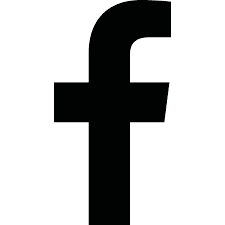 Image courtesy: Hindi Webdunia. He usually like to wear Kurta pajama or white dhoti, write poems and read books. Yet, when he smile his face looks like a child. Even when he has been serving as prime minister of India, from 1998 to 2004, barely anything could change his lifestyle. Atal Bihari Vajpayee helped reformed India’s economy by launching the Golden Quadrilateral project, the New Telecom Policy, the Sarva Siksha Abhiyan and the Fiscal Responsibility Act. In fact, he was considered to be one of the charismatic leaders India has ever born. And, probably, one of the few undisputed leaders BJP has ever born? Vajpayee died last Thursday (16th August, 2018), at 93, in New Delhi. 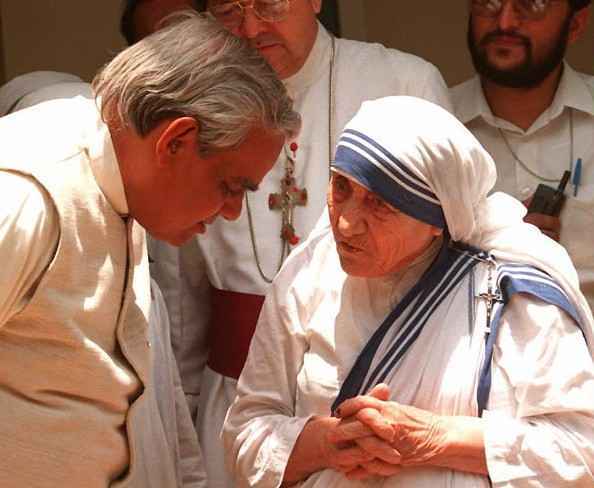 Atal Bihari Vajpayee with Mother Teresa, May 1996. Credit: Photo by TEKEE TANWAR/AFP/Getty Images (downloaded from Ibtimes). Vajpayee, who was born in a Brahmin family in 1924, in Gwalior, Madhya Pradesh, joined the RSS when he was 16-year-old. As a teenager he had attended rallies calling for freedom from British rule. In 1942, he was arrested while joining a crowd gathered at Bateshwar to protest against British Government and had to spend 24 days in prison. In 1947, the year India achieved independence from Britain, a young Vajpayee was thought to be an active member of the RSS. Unfortunately, in 1948, RSS was banned in India after Mohandas K. Gandhi was assassinated by a Hindu fanatic. In 1957, Vajpayee was elected to parliament as a BJS member. In 1977, BJS joined the Janata Party, which came into power the same year, and Vajpayee became the foreign minister. As a foreign minister he helped improved relations with China and Pakistan. During this time he was able to address the United Nations General Assembly in Hindi language, which was considered to be a historical event as no one had tried to deliver a speech in Hindi to UN General Assembly before. Unfortunately, in 1979, he gave resignation from his post just before a few weeks Murarji Desai’s government collapsed. 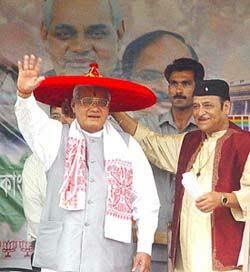 Atal Bihari Vajpayee was greeted by Bhupen Hazarika in Assam, April, 2004. Credit:Tribune India. It had been claimed by Hindus for a long time that the Babri Masjid—which was built by Mughal emperor Bābur in the early 16th century—was built on the site which is believed to be the birthplace of Ram, a supreme deity of Hinduism. What Advani-led BJP and their allies, namely RSS and the Vishwa Hindu Parishad (VHP), wanted was to destroy the mosque and build a Ram temple on the site. In December 1992, a large crowd of Hindu nationalists stormed into the mosque and demolished it in a few hours. Following the destruction of the mosque, however, violent riots broke out through northern India, in which, it was reported, more than 2000 people were killed. Vajpayee got terribly angry with religious extremists who had destroyed the mosque. He was, according to Encyclopedia Britannica, one of the few Hindu leaders to speak out against the destruction of the historic mosque at Ayodhya by anti-Muslim extremists. Later, an investigation carried out by the Liberhan Commission, led by Manmohan Singh Liberhan, a retired Chief Justice of the Andhra Pradesh High Court, revealed that people involved in demolition of the mosque were mostly from the pro-Hindu Bharatiya Janata Party. Ironically, this unsavoury incident—the demolition of the mosque—helped BJP win the 1996 general election and Vajpayee became the 10th Prime Minister of India. Unfortunately, after 13 days—when BJP failed to win majority in the Lok Sabha—Vajpayee had to resign from his post. However, in 1998, BJP made a successful comeback again and this time—with the help of other political parties—they formed the National Democratic Alliance (NDA), which, under Vajpayee’s dynamic leadership, ruled well for 6 years 2 months and 11 days. 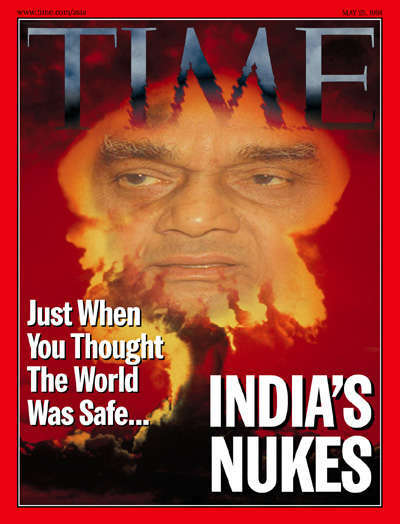 After India tested five nuclear weapons at Pokhran Test Range, Vajpayee was widely criticized by international community. The Time Magazine cover, May 25 1998. In May 1998, after two months he had taken oath as Prime Minister of India, Vajpayee, without signing the nonproliferation treaty, gave order to Indian Army to test five nuclear weapons at Pokhran Test Range, Rajasthan. Following suit, Pakistan, after 17 days, responded by testing six nuclear weapons at Ras Koh Hills in the Chagai District. Both the countries were widely criticized by international community and economic sanctions were imposed on them. Pakistan was said to be suffered the most by this sanction. However, after six months the sanctions were lifted. 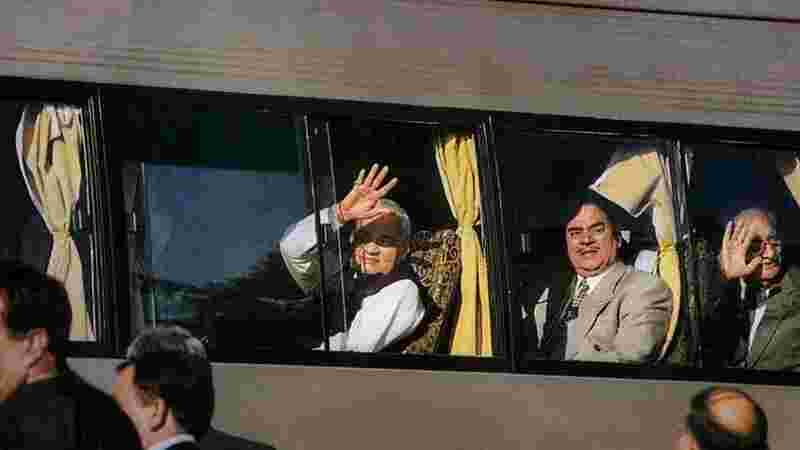 Atal Bihari Vajpayee waving from the Delhi-Lahore bus, 20th February, 1999. Credit: Hindustan Times. The cause of Kargil War, which took place between May and July 1999, was infiltration by Pakistani soldiers on the Indian side of LOC. "Vajpayee's visit to Lahore in February 1999," said Thomas Simons, an American diplomate and academic, "gave the Pakistanis the courage to be stupid, by occupying those heights at Kargil above the Indian supply lines in Kashmir during the winter while the Indians had withdrawn. And the Indians responded by driving uphill in the spring of 1999, and really giving every sign that they were going to go over into Pakistani hill territory and really start a war, to the point where Nawaz Sharif had to flee to Washington on July 4th, 1999, and get a very flimsy assurance of personal interest in Kashmir from President Clinton, as his cover to pull the troops back. So they were very close to war there." 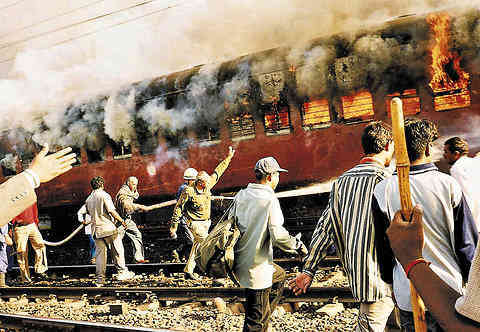 The fire on Coach S-6 on the Sabarmati Express claimed 59 lives, Godhra, Gujarat, 27 February 2002. Credit: The New York Times. 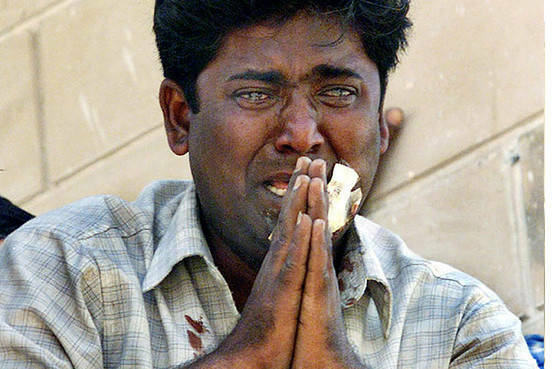 Qutubuddin Ansari, a 29-year-old tailor, begging for life after he had trapped in a building surrounded by angry mob in Ahmedabad, Gujarat, 28 February 2002. Image credit: ARKO DATTA/REUTERS, downloaded from The Wall Street Journal. After this horrific incident, the New York Times reported (on August 19, 2015, updated), "the charred bodies of the 59 victims are displayed for the public in Ahmedabad, Gujarat. 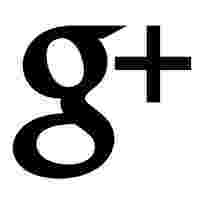 And, Narendra Modi, who has only been in power a few months, endorse a widespread strike." Soon a brutal violence was broke out between Hindus and Muslims in Ahmadabad and its surrounding places. "About 1,000 people, mostly Muslims, are killed. Some 20,000 Muslim homes and businesses and 360 places of worship are destroyed, and roughly 150,000 people are displaced." After failing to stop the communal riots that had started a month earlier, Narendra Modi, the Chief Minister of Gujarat (on the right) called to Delhi by Atal Bihari Vajpayee (second from the right). On the far left sitting L. K. Advani. March 27, 2002. 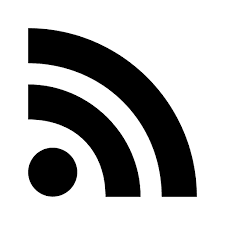 Image credit: Hindi Webdunia. 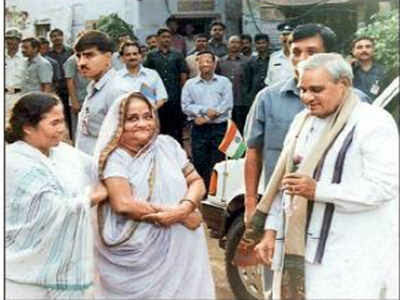 Atal Bihari Vajpayee was heavily criticized for the communal riots in Gujarat where a BJP government was on power at the time the violence had occurred. Narendra Modi was the Chief Minister then. Vajpayee fiercely condemned the violence, visited Gujarat, met the victims family in rehabilitation camps, and apologised to them. "I am ashamed," he said. During his visit to rehabilitation camps, many people told Vajpayee that if Narendra Modi had wanted, he would have stopped the violence before it had spilled over. 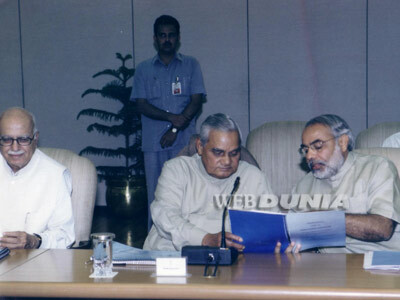 Before he left Gujarat, Vajpayee didn't forget to remind Narendra Modi about his Rajdharma (the duty of the rulers). "Rajdharma ka palan karo," he said to Modi. 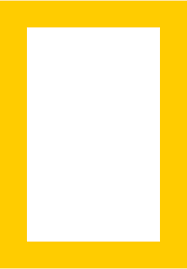 "Raja ke liye praja-praja mein koi bhed bhaw nahin hona chahiye" ("The ruler should not discriminate between his subjects"). According to media reports, Vajpayee wanted to give Modi the sack for his failure to control the riots. But, unfortunately, Vajpayee's deputy L. K. Advani protected Narendra Modi from being sacked. The reason: "Modi helped Advani win elections from Gandhinagar;" wrote Khushwant Singh in one of his articles. "Advani, in turn, exonerated him from the anti-Muslim pogrom charges of 2002." 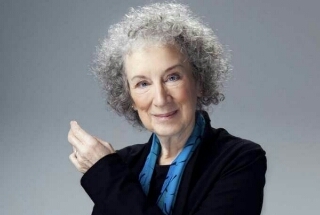 Sources: Encyclopedia Britannica; Wikipedia; BBC; The Telegraph; The Hindu; The New York Times; The New Yorker; Daily Mail; dailyo dot in; Hindustan Times; Human Rights Watch. 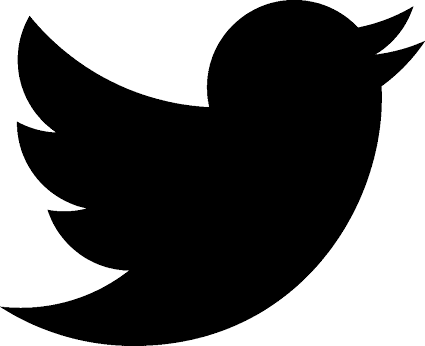 Many famous people had to surmount major obstacles on their path to success. Odd job was just a part of their lives. Pink-headed Duck: Is It Still Alive? 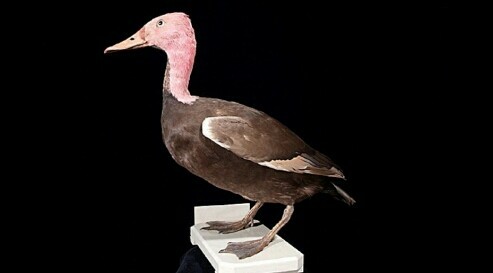 Pink-headed duck has gone extinct due to hunting and habitat loss. 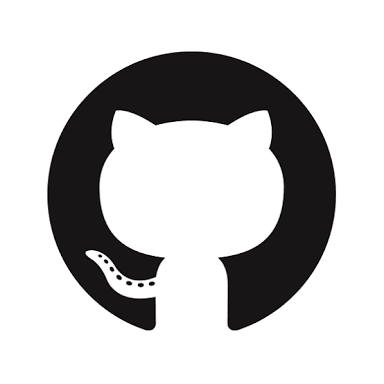 Last seen in the wild in 1949. 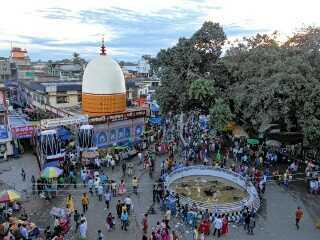 Like many other places in India, Durga Puja is also celebrated at Golaghat. 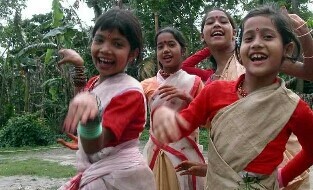 People in Assam celebrate spring festival in mid-April. It is Rongali Bihu. 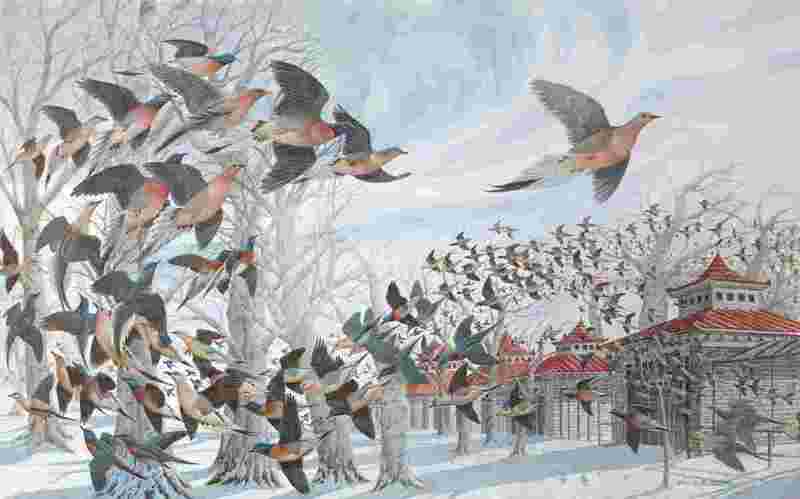 No matter how superabundant a species is, excessive hunting and habitat destruction can wipe it out within few decades. 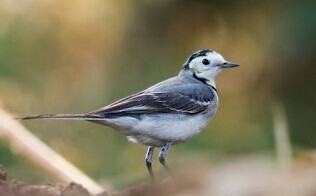 White wagtail is migratory bird found in Europe, Asia and Africa. Six species are found in Assam and NE India.